Esther SMART, born about 1856 and died about 1943 in Christchurch. She married Alexandra CLYNE about 1910 in Temuka. Henry Albert SMART, born about 1859, died on 11 January 1936 in Hamilton and was buried on 14 January 1936 in Cambridge. He married Elizabeth BOUGEN on 12 August 1880 at St Michael's Church in Christchurch. They had ten children. Maria "Ria" SMART, born about 1861 in Mt Grey and died on 24 July 1929 in Christchurch. She is buried in the Sydenham Cemetery in Christchurch. Maria married Sydney Herbert AMYES on 26 March 1890 at Irwell. They had five children. Edward Horton SMART, born about 1864 in Mt Grey. He married Sarah Matilda "Tilley" MATTHEWS on 23 April 1891 at St Michaels Church in Christchurch. They had four children. Gertrude SMART was born about 1864 in Sefton and died on 21 May 1948 and was buried in the Balcairn Cemetery near Rangiora. She married George DUNKINSON on 17 February 1882 at St Michael's Church in Christchurch. They had three children. John SMART was born on 12 July 1865 in Sefton, died on 10 August 1945 in Kaikoura and was buried in the Kaikoura Cemetery on 13 August 1945. 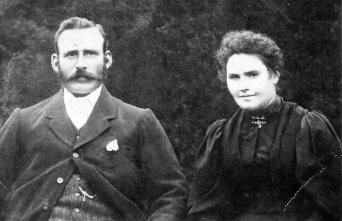 He married his first wife, Margaret McINNES on 30 September 1891 in Kaikoura. They had eight children. His second wife was Katherine Agnes ARBUCKLE and they had five children. James SMART was born about 1867 in Mt Grey and died on 19 May 1909 in Christchurch and is buried in the Sydenham Cemetery in Christchurch. He married on 10 December 1895 in Christchurch to Margaret SMITH. They had six children. Randall SMART was born about 1868 in Mount Grey. Nothing else is known about him. Thomas SMART was born about 1870 in Mt Grey and died about June 1875 and is buried in the Balcairn Cemetery near Rangiora. Robert SMART was born in 23 January 1871 in Mt Grey. Eleanor SMART (known as Helen "Nell" was born about 1875 in Mt Grey and died on 14 January 1961 in Christchurch and is buried in the Sydenham Cemetery in Christchurch. She married the same Sydney Herbert AMYES about 1930 that was previously married to her sister, Maria SMART. Her name on the wedding registration is spelt Elleanor. They had no children. Alice SMART was born on 23 February 1877 at Mt Grey and it is known that she died in Christchurch. She died on 27 February 1917 in Christchurch Hospital and is buried in the Sydenham Cemetery in Christchurch. Edith Adelaide SMART was born about 1879 at Mt Grey and died on 30 January 1934 in Christchurch and is buried in the Sydenham Cemetery in Christchurch. She married Fred SCHAFFER about 1911. There are no known children.